Regional tournaments located in the Midwest, East Coast, and Florida. Amateur youth freestyle wrestling tournaments and competitions, for students to wrestle in state meets or nationals matches. Drag/road racing facility, and home of the SCCA Double Nationals, and the NHRA Northwest Nationals. Contains schedule, history, tickets, and contact information. Stock car racing on high-banked, paved, 1/4 mile track. Featuring the Pro-4 Nationals, Late Model Sportsman and Stock Pony Nationals. Illustrated history of Ron Johnson, and the Shubert and Herbert, Jr. fuel front engine dragster. Winner of the Goodguys 7th Pomona Nitro Nationals, and the 15th Nitro Nationals. Formerly a winner in the Top Dragster Quick 8 series, turned Top Fuel driver winning the 2003 IHRA Rocky Mountain Nationals and IHRA World Nationals. Profile, photo gallery, news, schedule and fan club. Webmaster opinions and observations concerning the team. News coverage, schedule, and statistics. U.S. motocross championships. Includes same day results, photos and track information. Offers news and scorecards plus World Cup and Nationals reports. Holds competitions around the United States. Includes event details, news, links and registration information. Programs, newsletter, and links. Canada Games, and Nationals information. Based in Oakville, Ontario. NBL race track in Binghamton, New York. Host of NBL Regional Nationals. Includes photos, directions, schedule, and highlights. Consists mainly of St. Lucian nationals. Provides pictures, news items, upcoming events, a history of the team, and a listing of members. Official team page with headlines, statistics, photograph galleries and general team information. A club that draws players from alliance members playing as a tournament-only team during club soccers 'off season'. Modified Midget track located in Garden City. Host of the 2001 NMMA Nationals. Schedule, pictures, driver profiles and point standings. This 4/10 mile, semi banked, dirt oval is located near Greenwood. Classes include NASCAR Late Models, Pro Am, Hobby Stock and Grand Nationals. Sanctions dirt late model and modified racing throughout the U.S. and Canada. Home of the UMP Summer Nationals and King of Dirt series. Northern California and Nevada ASA adult Mens, Womens, Coed and slow-pitch softball tournaments. Qualifiers, Regionals, and Nationals. Brings little league players from across the country to play in three different divisions. Offers information on the Open World Series, Tournament of Champions, and All-Star Nationals. If the business hours of American Youth Basketball Tour in may vary on holidays like Valentine’s Day, Washington’s Birthday, St. Patrick’s Day, Easter, Easter eve and Mother’s day. We display standard opening hours and price ranges in our profile site. We recommend to check out aybtour.com/ for further information. 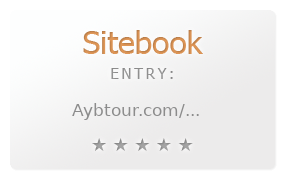 You can also search for Alternatives for aybtour.com/ on our Review Site Sitebook.org All trademarks are the property of their respective owners. If we should delete this entry, please send us a short E-Mail.